This song started off as an old English traditional folk song about Lord Randal, but the lyrics get changed as time goes by. It goes back hundreds of years and is more popular in Ireland than England. The video of myself shows how to play the song on guitar. The song was also recorded by Al O'Donnell with The Dubliners, Sons Of Erin, Bob Lynch, Frank Harte, . Pete Seeger done a version with different words than this version. The tin whistle sheet music notes and the ukulele chord shapes are included. And I[D] want to[A] lie[D] down. And I want, to lie down. 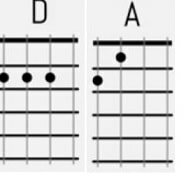 Below are the ukulele chord shapes for Henry My Son in D.
This is one of the easy songs you'll ever learn to play. Just two chords for the whole song. I play this one in the key of D Major. I don't play all the verses as it's only here to give you a feel of how it goes. And I[G] want to[D] lie[G] down.